1) If Microsoft installs an automatic update, will this update be added to the backup image in the next schedule incremental backup? 2) Or is the backup image "locked" not permitting any change? 3) If for any reason one file in the operating system becomes corrupted, can I restore just that file from the backup image? With the way that the question is worded, I'm concerned that you may have missed the point of my statement. If you don't have installation media, that initial image backup can be an important, occasionally even system-saving backup to have. As it turns out, most of your questions are about what happens after that. Particularly when you get a new machine that does not come with true re-installation media, I advocate taking a full system image backup of the machine as soon as is practical; I also recommend it even if it does. That single backup allows you to restore your machine to the state that it was in at that time, meaning the time that you got it. The backup's not "locked," as you put it, but you don't want it to be updated. That's the whole point of this image - to be an image of the system as it was when you got it. That means without any updates. If for some reason you decided that you need to reinstall Windows from scratch, you could restore to this initial image instead, which would put your machine in roughly the same condition. So, take this initial image as soon as you can and then save it somewhere safe. Hopefully, you'll never need it. But if you do, you'll be glad you have it. After your initial backup, then absolutely setting up a regularly scheduled series of full and incremental backups is just part of good ongoing maintenance and protecting yourself from failure. 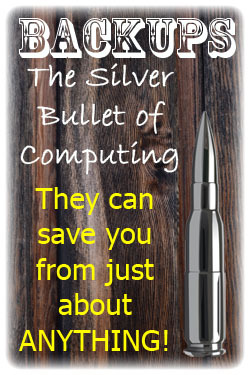 Regular backups are the silver bullet of computing: they can save you from just about anything. When an update occurs, then yes, the next incremental backup will catch it. In fact, the next incremental backup will take any and all changes that have happened to your machine since the prior backup, including not only system updates, but any file that's been added or changed, including your data. An incremental update typically does not modify the original backup image. More commonly, the incremental update is a separate backup file or set of files that contain only those changes since the previous backup. When it's time to restore, the original full image backup and all of the incremental backups taken since then must be present to restore to the most recent point in time. That's why a blend of periodic full backups (I do mine once a month) followed by incremental backups (I do mine daily) is typically the best approach. Each full backup resets the clock, and only it and the incremental backups taken since that time are required to restore to the most recent. Most backup software will absolutely allow you to restore just a single file from a backup image or a full backup image and its set of subsequent incremental backups. The one notable exception seems to be Windows' own built-in backup, where image backups and file backups appear to be two separate things. Images are easy to restore completely, but extracting single files from the image seems to be difficult at best. Whether or not restoring a single file is the correct method depends on the situation and the file. Restoring a single data file of your own is clearly up to you - only you can know if it's the copy from the backup that you want or if you need to something else. Typically, though, this is probably the most common use for backups of all sorts: restoring a file that was accidentally deleted, changed, or otherwise hurt. Restoring a system file gets tricky. Depending on how you know that a particular system file is corrupt and how it became corrupt, restoring that single file might be an appropriate solution. 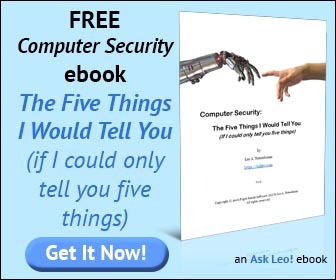 Or the solution might require something much more involved like a Windows repair, a reinstall, or restoring to a full system image backup that was taken prior to the corruption. Is keeping an image backup of my cleanly installed machine a good idea? An image backup can serve as a great checkpoint to restore to in the event of failure, and can even help avoid needing to reformat and reinstall. What good is an image backup if I just want to backup and restore my data? Image backups are great ways to backup absolutely everything on a hard disk. They're also good for retrieving most anything, including individual files. I finally broke down and bought an external drive and used the included software for an image and incremental. Then the external drive took over my computer. Every time I turn on or otherwise reboot, the external drive uses 99% of the CPU to do something or other. I don't know if it is booting from the external or making another image. I finally just unplugged the thing and I'll hook it back up when it's time for another image. Whew. You might consider using a backup program like Macrium Reflect instead of the one which came with your hard drive. Open Disk Management click on Action > Attach VHD and browse to your image. You need to look for a file with a .vhd extension, there will probably be two, find the one that has "Users" and click on Users, Windows Explorer will open with your backed up files. Now copy the files you need to your desktop. I'm using Genie Timeline Pro that came with my IOSafe rugged drive that I just got. I did an initial backup and incrementals automatically since then. I created an ISO file also but I'm not sure whether it includes everything on the C partition or just the operating system. Anyone know? My main concern on the previous post is the programs, if the ISO is the operating system B/U and the data is B/U up via Genie, than what is B/U the programs?